We really enjoyed the Calgary Global Petroleum Show, June 12 – 14. Pictured left is our booth as it was set up at the show. It was interesting to find our booth situated between two of our biggest competitors – Thawzall and MMD. I’m sure some of those passing by were chuckling along with us at the irony of that placement. We have to agree, it did give our customers a pretty good idea of how our products rank against the competition! We are very proud of our products and happy to pit them against anyone, anytime. 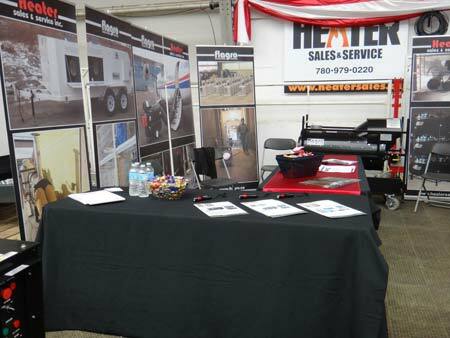 We at Heater Sales and Service were pretty excited that the Petroleum show coincided with the launch of our newest product line – Flameless Heaters from MAC Inc. Thanks to flameless technology, these units are extremely versatile, safe and efficient. Since there is little danger of combustion, they can be brought right inside a tent or tarp, reducing or eliminating the need for ducting and making them even MORE efficient. The MAC 750F and our other flameless models attracted a lot of attention at the Petroleum show from oil producers, mining companies and rental houses. We were thrilled with the opportunity to chat with Hertz Equipment Rental’s Maintenance Manager Larry Klatt and give him the scoop on our new flameless heaters, as well as our other quality products. Thanks for stopping by our booth, Larry. Overall, we felt it was well worth our time to spend a few days networking with oil execs and other business types at the Calgary show. Next up: Fort McMurray’s Oil Sands Trade Show, September 11 & 12. Hope to see you there! Heater Sales & Service Inc. (HSS) has been providing portable heating products since 2008 throughout Western Canada and the Northwest Territories.